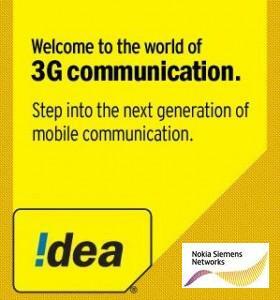 IDEA Cellular, Pan India mobile service operator today announced that it has commissioned Nokia Siemens Network (NSN) to build and manage its 3G HSPA network in four telecom circles and supply equipment. Under the contract, NSN will deploy its base stations, provide network implementation, project management, care and maintenance services, and give support to the operator in managing its 3G network in four circles -Uttar Pradesh (East), Uttar Pradesh (West), Kerala and Haryana. Idea Cellular had won 3G spectrum for 10 telecom circles – Maharashtra & Goa, Gujarat, Andra Pradesh, Madhya Pradesh & Chattisgarh, Himachal Pradesh, UP (East) UP (West), Punjab, Haryana and Kerala. when is idea going to launch its 3G service in Daman………m just fed up of takin idea broadband………no speed……..wat is idea doin???? ?